It's been raining constantly, Daylight Savings is this weekend, and for the first time in a long time we had to turn on the thermostat. All signs point to winter, which means it's time for the heavy-duty outerwear to come out. Every winter I seem to find myself "investing" in a new winter coat (and consequently building up quite a collection!). In a way, it makes sense. A well-made coat not only keeps you warm but forms the outermost and therefore most visible part of any outfit. It's also the most highly complimented piece during colder seasons in my experience. So based on years of coat-buying and compliment-reaping, here are my top picks if you're in the market for a new one. 1. A statement-making pattern adds visual interest to neutral and colourful ensembles alike. Although this coat is described as tweed, to me it looks more like an outsized raffia print. Love. 2. Neutral colours and normcore are dominating stores this season, and a dependable black peacoat will always have its place in a woman's wardrobe. But trust me: a colourful coat—particularly in a playful hue like orange and a classic cut—will invite more admiring comments and envious once-overs every time. 4. For the ultimate in casual charm, throw a puffer jacket over a chambray shirt for weekend brunch. This one gets brownie points for its buffalo plaid shoulder accents and streamlined shape. 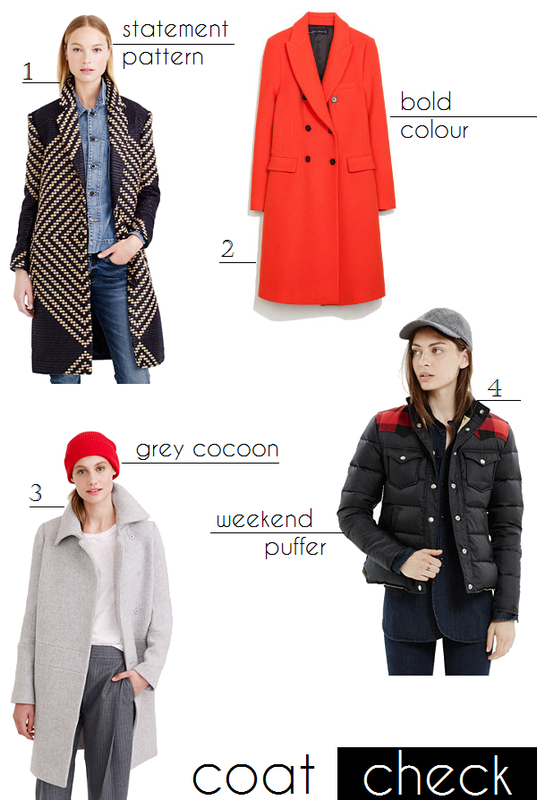 I LOVE the colorful coat (#2), especially since so much of my wardrobe is black-grey-beige neutral tones.